Lightspeed Aviation announced the Fly Me to the Moon contest, which runs May 23 through June 26, 2016. The pilot who flies the most miles during private flights — as tracked through CloudAhoy tracking and debriefing service — will win their choice of any of the four models of Lightspeed premium ANR headsets including Sierra, Zulu.2, Zulu PFX, or the new Tango wireless headset. First runner up will win a Gann leather flight bag and second runner up will win a Markham leather flight bag, both from Lightspeed's Adventure Flight Bag Collection. Anyone with a free or standard CloudAhoy account can enter the Fly Me to the Moon contest. Continue reading "Fly Me to the Moon Contest"
Dutifully, we did enter the Lightspeed booth and took the briefing on the Zulu PFX. Turns out these are not new, but were brought to market almost exactly a year ago, but would you like to try on a pair? Continue reading "Gnarly Noise Negators"
Lightspeed says it has raised the standard for active noise reduction headsets with its new Zulu PFX. At a news conference at AirVenture 2013, the company unveiled a headset that automatically customizes the noise reduction while enhancing the sounds that the pilot wants to hear for a "personal flying experience." 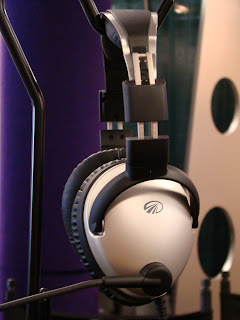 The ANR system uses microphones on the outside and inside the earcups to sense and then act on unwanted sounds while at the same time increasing the fidelity of voice transmissions and music. It also measures and maps the ear of the wearer to customize the sound response. "It's a significant breakthrough," said CEO Allan Schrader. The new headset will cost about $1,100, up from $900 for its existing Zulu 2 ANR line. Continue reading "Lightspeed Unveils "Quietest" Headset"
A lot of buzz has surrounded LightSPEED Aviation's newest ANR headset, the Zulu, introduced at AirVenture 2007, with the first sets shipping in September 2007. Featuring Bluetooth connectivity between the headset and your cellphone, MP3 player or other compatible devices, LightSPEED has integrated current (and convenient) technology with the headset's aviation-specific features. It's drawn a natural comparison with Bose's Headset X; however, at $850, it's priced at about $150 less than the Bose. We caught up with Allan Schrader, president of LightSPEED Aviation, at the LightSPEED booth (Hangar D) to talk about the headset's review featured in the April 2008 issue of sister publication Aviation Consumer. He told us the headsets that were reviewed were produced about 2000 sets prior to the headsets that are currently available. Schrader adds that two of the issues—music muting and noise gating—identified in that review had been brought to LightSPEED's attention in advance of the review, and were corrected in February. Music muting is the process that brings the volume of the music down when there's an overriding signal such as an ATC call or in-cockpit conversation. Testers had observed that when the voice signal was weak, it would not mute the music sufficiently (for instance, if you're monitoring ATIS 30 miles out). The threshold was lowered to eliminate that issue; the music is now muted about 80%, so low you'd hardly notice it. After the voice signal has stopped, the Zulu will bring the music back up over 5 seconds. Schrader added that this feature is selectable so that a backseat passenger can rock out to Chris Daughtry's latest without the continual interruption from ATC. Noise gating was added to the headset to mitigate the hiss produced by noisy intercoms, "basically a squelch for audio," explains Schrader. "Noise gating disconnects the audio plug from the intercom until such time as there's a signal on the audio line," such as an in-cockpit conversation or an ATC call. Again, the audio threshold was lowered to prevent a conflict between a weak signal and the headset's noise-gating capability. You can read Schrader's complete response to the April review in the May issue of Aviation Consumer, which will be available within a few weeks. For more information, visit LightSPEED Aviation.